Cottontails Baby: Big Garden Birdwatch - get ready! Big Garden Birdwatch - get ready! Don't forget this weekend is the The RSPB Big Garden Birdwatch. It's easy to take part and simply involves sitting by a window for one hour and recording all the birds you see (i.e. enforced relaxing bird watching time - bliss!) All the details are on the website here, along with a sheet to help with bird identification. In the meantime, to help you get ready, can you identify any of the birds in this photograph? 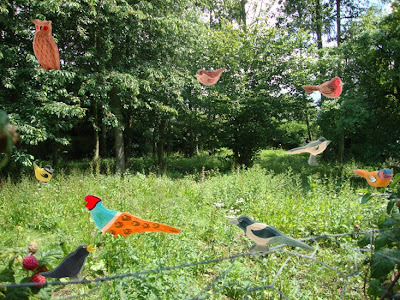 The photo is an area of wilderness on the farm we are moving to and the birds are little handmade wooden creations from Ostheimer. All our Ostheimer toys are on the website here, we don't stock a lot of the birds but can get them in pretty quickly. And I am awaiting an order from them at the moment with lots more little animals - woodland and farm animals. 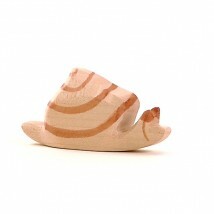 Even a little wooden snail is on his way. Slowly. what lovely wooden birds and such a nice little wilderness area too! Good luck with your birdwatching, may you see many wonderful birds!